Obsessive Compulsive Disorder is an anxiety disorder and is expressed by recurrent, unwanted thoughts, repetitive behaviours. Repetitive behaviours can include cleaning, counting, hand washing are generally performed with the hope of preventing obsessive thoughts. Obsessive Compulsive Disorder is the fourth most common mental disorder and it is as common as diabetes and asthma. I know one of my close friend who is sufferer of OCD (Obsessive Compulsion Disorder). He discussed this problem with me and presented his horoscope to study whether stars have to do something with this disorder. I observed his horoscope and found that, yes,. this disorder can be located in the horoscope. For long, I have been trying to find out whether planets have their role in gifting this disorder to a native. Interestingly, in the horoscope, of my friend (which is as under) it has clear indication. I shall try to elaborate that planets do have their role in giving a particular disorder depending upon their placement in the horoscope. Mercury and Sun in twelfth house. Though Mercury (Lord of ninth house) is exalted, but the placement in twelfth house has weakened both the planets. Moon in sixth house aspecting Mercury. Moon in Pisces makes a person restless, easily depressed and over- sensitive. He cannot even tolerate the slightest sufferings and takes every thing emotionally. It is generally hard for him to digest the practical and hard aspects of life. Presence of Mars and Ketu (Dragon's tail) in the first house (House representing Brain). 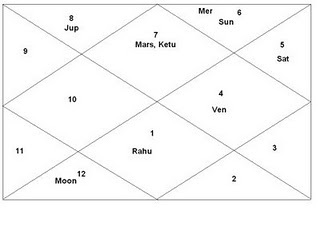 Mars and Ketu (In first house) being aspected by Saturn from the eleventh house. Rahu (Dragon's Head) in Aries Sign aspecting the ascendant from seventh house. Rahu being in fiery sign has absorbed the quality of Aries. Natives of Libra ascendant (which is considered a symbol of balance -TULA) are considered to have great sense of justice. They cannot tolerate injustice to any one - even to animals. When they face a situation which shows the sign of injustice to others and self they feel hurt. If Moon and Mercury are not strong enough, they take some hurting incident at heart and may develop the sign of OCD in due course. Moon in sixth house and Mercury in twelfth house have helped him to develop this disorder. I think, apart from other factors, this is the main planetary pattern contributing for development of OCD in his horoscope. Rahu (Dragon's Head) is the second main reason for this development which is placed in seventh house and aspecting First House. If not well placed, Rahu is famously known for giving psychic disorders to native. In nutshell, First house (House of Brain and thoughts) is badly affected by presence of Mars and Ketu in it and being aspected by weak Saturn (the planet affecting nervous system) and horrible Rahu. Moreover, the presence of Moon in sixth house and Mercury in twelfth house (already discussed above) has its pivotal role in providing this GIFT to him. This is interesting to note that disorder is not inherited and no one in his family has symptoms of this type of disorder. I have presented my views after deeply observing his horoscope and as per guidelines of Vedic Astrology which is unique in finding out psychic nature of a person.